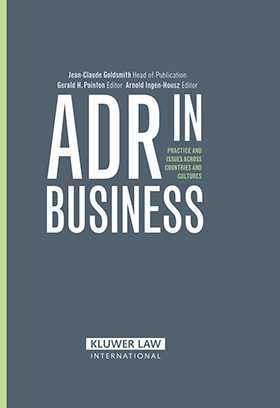 The purpose of this book is precisely to look at ADR on its own terms as a way of resolving business disputes, particularly at the international level. Drawing upon diverse approaches, ADR experts from a variety of countries explore the situations to which ADR lends itself and the different permutations it offers to allow each dispute to be handled in the manner most fitting to the circumstances. The contributors also show how ADR serves such important considerations as the interests involved, the need to avoid a public display of differences, and the wish to anticipate problems. By throwing new light on the achievements of ADR and the possibilities it offers, this book will help to situate ADR amongst the panoply of dispute resolution methods now available to the international business community. Preface. Jean-Claude Goldsmith. Editors Note. Foreword. Robert Briner . Foreword. Pierre Tercier. Foreword. Lord Mustill. Part I. ADR in International Business. Chapter 1. ADR and Business. Carita Wallgren. Chapter 2. Reasons for Choosing Alternative Dispute Resolution. Jean-François Guillemin. Chapter 3. Ambit and Potential of the Green Services in the ICC Dispute Resolution System. Arnold Ingen-Housz. Part II. ADR, DB and the ICC. Chapter 4. ADR under the ICC ADR Rules. Peter M. Wolrich. Chapter 5. An Efficient Dispute Management Tool. The Dispute Board and the ICC DB Rules. Pierre M. Genton . Part III. ADR and the Law. Chapter 6. Legal Issues Raised by ADR. Charles Jarrosson. Part IV. ADR as Practiced across Countries. Chapter 7. ADR in the United Sates A Practical Guide. Elpidio Villareal. Chapter 8. ADR in East Asia. Michael Hwang S. C., Long Seng Onn, Yeo Chuan Tat . Chapter 9. Better Dispute Resolution The Development and Practice of Mediation in the United Kingdom Between 1995 and 2005. Michael Kallipetis, Stephen Ruttle. Chapter 10. The Belgian Law on Mediation. Herman Verbist. Part V. ADR across Cultures. Chapter 11. Cultural Diversity and ADR Practices in the World. Nabil N. Antaki .